A tragic incident a few months ago triggered a chain reaction of support for a local family in need. Lanigan Elementary School fourth grade student Noah Horning watched as seven fire departments worked to save his neighbor’s home earlier this year. The family escaped the fire safely, but lost everything. 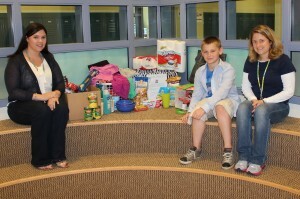 Lanigan Elementary School fourth grade student Noah Horning is pictured with his classroom teacher Shannon Higgins, left, school-home liaison Tammy Sheldon, and a portion of the items that students and staff at his school donated for a collection he organized to support a family in his neighborhood that lost their home to a fire earlier this year. Noah knew there was something he could do to help the family and he knew just who could help him – the students and staff at his school. He spoke to the neighbors following their tragedy to ask what items they are in desperate need of. Then, with his principal’s approval, he sent a letter home with each student at his school asking for toiletry and non-perishable food donations as well as clothing for the family’s young daughter. Also included in Noah’s letter home was helpful fire safety reminders and precautions that each Lanigan family can take to stay safe including developing and practicing a fire safety plan and escape route. The response to Noah’s letter was overwhelming and hundreds of donations poured into the school to support the neighboring family in need. With help from his classroom teacher, Shannon Higgins, and the Lanigan Elementary School School-Home Liaison, Tammy Sheldon, Noah boxed up the donations and personally delivered them to the family during the last week of school. Noah, Papa and I are so PROUD of you and all that you have done to help this family. We love you so much! You are a wonderful young man and we are proud to be your grandparents!! !